CAMARILLO, Calif. -- When a course personifies the most common features of a region it can be considered "classic." But that tends to miss the point. The par-3 15th is the signature hole at Sterling Hills. 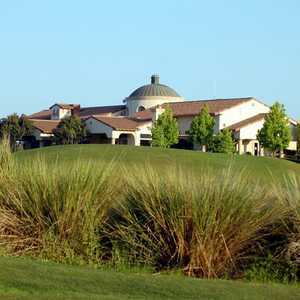 Sterling Hills Golf Club should not be construed as a "classic" southern California golf course any more than Augusta National is a classic Southern course. Located on the east end of Camarillo, about 57 miles northwest of central Los Angeles, Sterling Hills has many of the same elements as well known Southland courses like Riviera Country Club and Bel-Air Country Club. That means gently rolling terrain, rye grass mixed with poa annua fairways, poa greens and eucalyptus trees, which is what you'd find at Riviera (along with kikuyu grass). But having the same elements as Riviera doesn't make Sterling Hills a "classic". Interesting design and terrain do give the course a distinct Southland feel. That said, it is welcoming to the 25-handicap player as well as challenging to the 5-handicapper, which is a tribute to Damian Pascuzzo, who designed the golf course as part of the Robert Muir Graves firm. You get that classic -- there's that word again -- Southland look on the downhill par-5 fourth, with a stand of eucalyptus running the entire left side of the hole. A pond on the right comes into play on the layup third and runs past the green. It's a good birdie hole, but the terrain, the view and the risk-reward factor make the first-time golfer stop and savor. The par-4 sixth might be over-designed. A large bunker complex sits on the right and two lakes sit on the left, making a proper placement on the tee shot essential. The severely left-to-right slope in the green invites three-putts. That's how a 355-yard hole gets turned into the second toughest on the front. In this man's opinion, the bunkers on the right can be minimized without compromising the integrity of the hole. The back starts with another short par 4 and relatively short par 3 and then the stakes get raised on holes 12-15. The first is an uphill par 4 of 375 yards that is guarded by a severe bush-covered wasteland right of the fairway and in front of the green. A deep drive followed by a properly judged approach is essential. Reversing direction, the 395-yard downhill 13th calls for a draw around a sentinel palm tee near that same waste area for a good position to attack the green. The tee on the par-4 14th sits on extreme west end of the property, and this hole calls for a left-to-right drive. Out-of-bounds looms on the right. But even a deep tee shot sets up a slightly downhill approach over a deep recession in front of the green. Sterling Hills' signature hole is the 170-yard 15th, whose approach must carry water. Interestingly, Pascuzzo designed the green with two distinct levels that run perpendicular to the tee box. The lower level is nearest the water, the highest in the back. That helps the distance-challenged golfers who hit a hybrid or long iron into the green. The higher slope in the back helps keep balls on the green. Par 5s on the 16th and 18th sandwich the toughest hole on the back, a 420-yard par 4 back into the prevailing breeze out of the west. It adds up to a golf course that measures less than 6,400 yards from the blue tees with a slope with a seemingly bland rating of 126, numbers on the card that do not bring out the joys nor the stress that can be encountered. "It's very well maintained," said Ben Dolly, who drove up from Hollywood. "But on this day, it was a little slow -- 5 and a half hours. But the staff was out and they are very nice. That's why we came out on a replay. To get the most out of it." Built within the confines of a real estate development in which streets have to be crossed, carts maintain the pace of play at Sterling Hills Golf Club. But this course is walkable. The best comes on the back nine but that doesn't mean the front is forgettable. 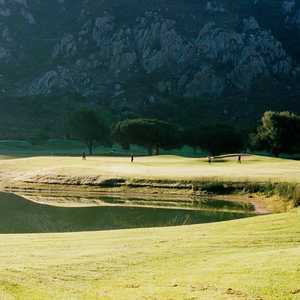 It's a solid course that makes it playable for hit-and-giggle couples as well as buddies playing a four-man death match.